Photos courtesy of Troy Jones Jr. When natural born athletes shift out of traditional sports like football over to martial arts, big things happen. Troy “Trouble” Jones Jr., 27, is one example. 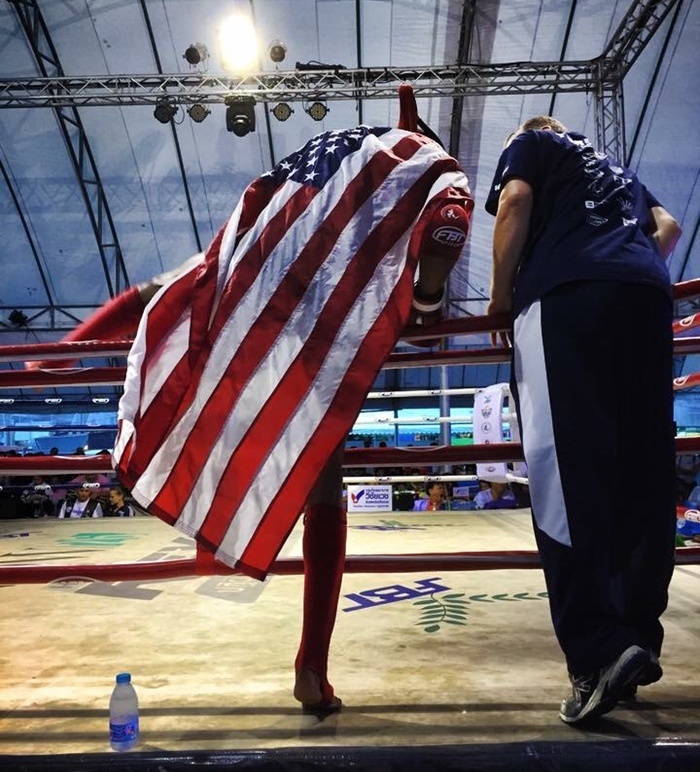 He’s been training Muay Thai out of the Academy in Brooklyn Center, Minnesota for less than three years, and he’s already amassed an unbeaten record of 15-0 5KOs, steamrolling opponents all the way to the gold medal in the International Federation of Muay Thai Amateurs (IFMA) Royal World Cup a couple weeks ago in Bangkok, Thailand. It was the first gold medal for an American since 2010. Jones was an All-American, All-Conference free safety at Minnesota State College and Harper College in Palatine, Illinois, but the NFL never came calling. After college he drifted back home and bounced off the walls with no one to compete against, nobody to hit, no tackles to make. So he wandered into Greg Nelson’s gym, the MMA Academy, and started hitting the pads. It felt good. That right cross. BAM. Superman punch. BAM. Mornings at the gym, rest of the day at work, evening back in the gym. Negotiate with the boss to get a couple more days for three-a-day sessions. Suddenly Jones is at the 2014 Thai Boxing Association (TBA) in Des Moines knocking people out. Beating people and coming out unscathed. Wins came easy for Jones because the grind was nasty and familiar. 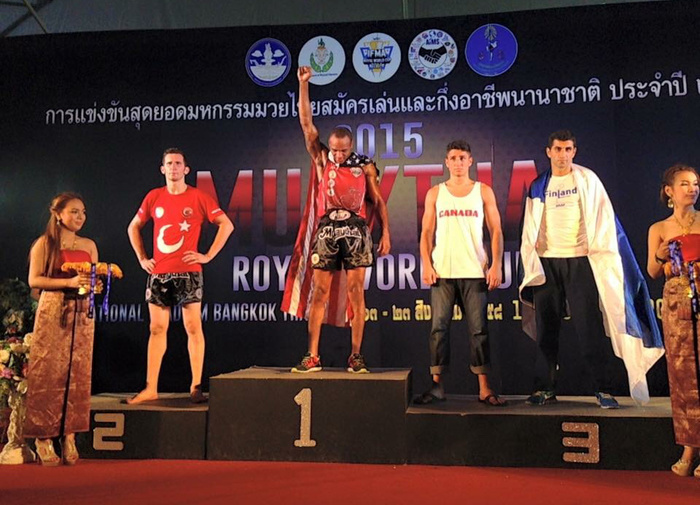 He qualified for the US Muay Thai team, the team headed to Bangkok to compete against hundreds of other nations, thousands of other fighters. Then he waited. Decided to take another TBA belt last June, and then got the call the next day. We’re going to Thailand. The local television crew showed up at the gym, talked to his fiancée and his mom, and gave him a fist bump through the ether. A little fame and something to post on Facebook, good stuff right? But US athletes live in a very different world than athletes from other nations. In China, for example, pretty much all fighters—amateur or pro—can rely on a stipend from a gym, or from the local government, and the higher they get the more cash flows in. It’s a job. But in the US fighting for the country against thousands of other men and women is a “hobby” and you have to pay for it yourself. There are people who step in and try and help, selling shirts, running GoFundMe campaigns, and spreading the world. But really, the motivation is not food on the table or a new car, but glory. It sounds kitsch unless you’re the one training every day, building yourself up, getting better, smoking that grind day in and day out. Then it’s just truth to you. A far cry from the NFL, yet that too is a good thing. Jones beat the three men standing in his way for the gold medal in Thailand—despite terrorist bombings and the ~30k Euros motivating the Turkish champ—and brought it home. 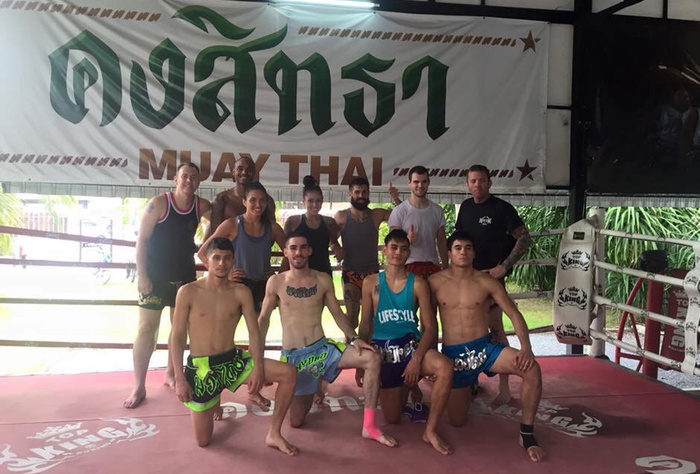 Now he’s taking it easy for a bit, nursing a broken/re-broken foot and a few other bumps and bruises he earned on the lightning run through the Muay Thai world. His success is a sign of times to come. Athletes from small football programs who don’t get scooped up by the NFL, or just find themselves losing passion for one sport and gaining it for another, will change the fight game. We are already seeing incredible technique being utilized in the cage, as training methods evolve. When the pool of fighters starts sucking up talent normally headed into the big three—NFL, NBA, MLB—what we deem today to be a “meteoric rise” will be the norm. Troy “Trouble” Jones Jr. flattening the field for that gold medal is just the beginning.